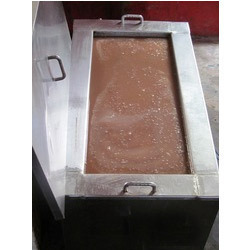 We are prominent name in the market, engaged in providing wide range of Chocolate Dipping Tank in the domestic market. Highly appreciated in the market for their easy to use and optimum performance, these are stringently tested by our quality analyzers on predefined parameters to ensure their flawlessness. Our offered tanks are highly recommended for their effectiveness. Krishna Refrigeration is professionally managed organization engaged in manufacturing, exporting and supplying premium quality Ice Cream Freezer Machine, Ice Cream Candy Plant, Deep Freezer, Water Cooler, Chilling Plant, Cold Room, Combination Freezer, Display Counter. We (Krishna Refrigeration) are also an authorized dealer of V-STAR Appliances. We are offering our services to Ice-Cream industry, Frozen Foods shops, Bakery, Dairy, Pharmaceuticals, Medical, Chemical, Agriculture Industries and All Super Markets. Since 1991, we have been dominating the market through innovative technologies and exemplary services. Over the years, our sales and application support teams have developed expertise in providing best solutions for different applications. Further, we seamlessly integrate the process of designing and engineering to develop collaborative models with great emphasis on innovation and value. We are committed to provide our clients best return on their investment by providing consultancy services for Ice-Cream plants with highly qualified dairy technologist,highest quality products with up-to-date features and performance and also undertake Turnkey Projects to setup new Ice-Cream Industries.